According to the 2016-2017 Junior League of New Orleans annual report, approximately 90% of our active members work outside the home. Of those League women in the workplace, many have chosen to follow their passion for self-employment. 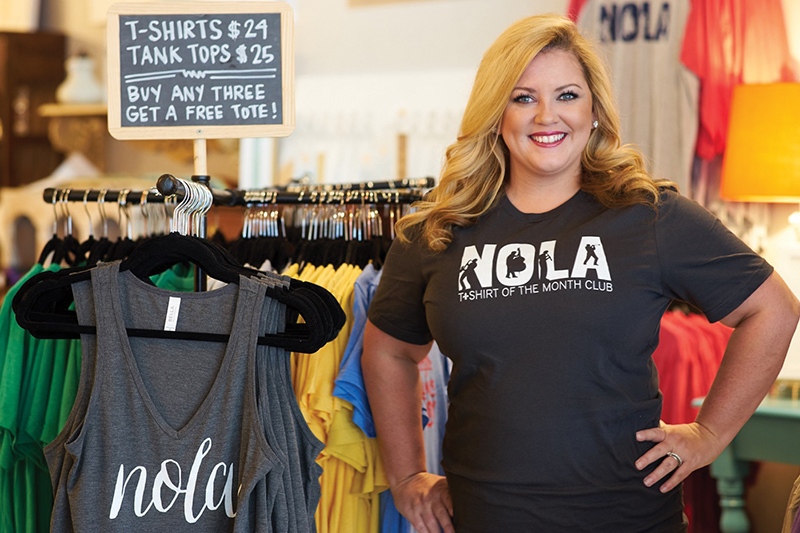 From contributing to New Orleans’ booming hospitality industry to providing vital professional services, JLNO entrepreneurs shape our local economy and build our Crescent City community. Jackie Abston founded NOLA T-Shirt of the Month Club with her husband, John. Their company was borne out of their mutual love of New Orleans and an unwavering belief that it is a place like no other. The only way to properly tell that story, they decided, was through fashion. So, in November 2015, Jackie invested just $20 into placing Facebook ads. She hoped that their growing social media following would translate into customers willing to pay a $15 monthly subscription fee to receive a creative t-shirt reflecting their pride in the city. It worked. In addition to a long list of subscribers receiving t-shirts from their company in each month, Jackie now operates a retail shop at 3646 Magazine Street. There, customers can choose from a variety of designs, like those depicting the ubiquitous “Geaux Cup” or saluting the beloved Saints quarterback Drew Brees, or they can order custom t-shirts for any occasion. For Jackie, owning a small business meant relying on the lessons of her childhood: hard work, honesty and living by the “Golden Rule.” These things, she says, have led to her success as an entrepreneur. Sarah Wild spends each day, as she puts it, “making tomorrow brighter” for non-profit organizations. Her company, Wild Fundraising, develops fundraising strategies to support charitable groups across America, from Girls on the Run New Orleans to McGroarty Arts Center of Tujunga, California. Founded in 2014, Sarah launched her fundraising businesses while attending graduate school, hoping for a sensible way to earn a living while completing her studies. But instead of it simply serving as a temporary job, fundraising became her long-term career. 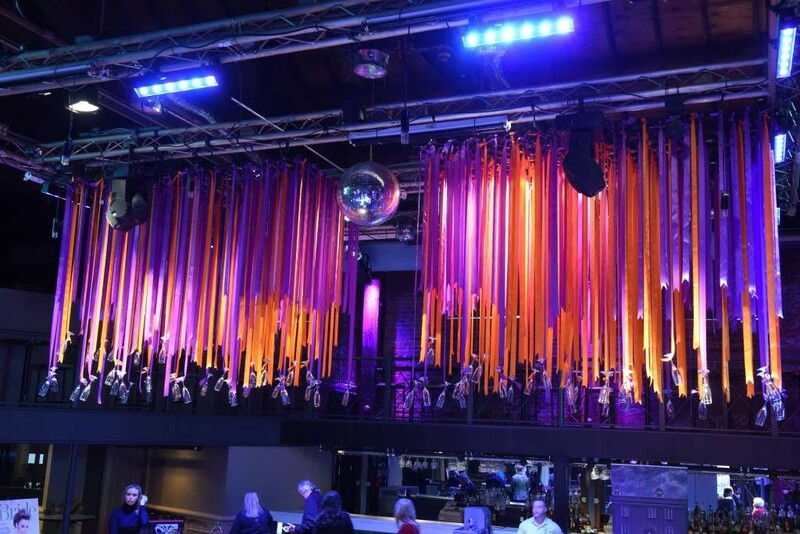 Wild Fundraising manages “the entire spectrum of grant and sponsorship solicitations for small and mid-sized charities,” which spans from discovering funding opportunities to crafting annual reports. While her office is based in Mid-City, she serves non-profit clients across the country eager to expand their charitable reach through greater funding. Sarah said “passionate and capable women” have taught her how to overcome adversity and achieve big things in the business world. Learning from their experiences – and her own – have been the key to delivering results for her clients. For Kimberley Tara, entrepreneurship is a key feature on her family tree. “Growing up, both of my parents had their own businesses, so I guess you could say it’s ‘in my blood,’ she explained to Lagniappe. But for Kimberly, the appeal of owning her small business was far greater than honoring a family tradition. It allowed her to swap her role in public accounting with self-employment, giving her a solid work-life balance while meeting the unique needs of each client she serves. As a Certified Public Accountant (CPA) and a Certified Tax Coach (CTC), Kimberly specializes in “proactive tax reduction strategies” to legally save families and businesses as much money as possible. She also performs traditional tax compliance work. Kimberly views “every client relationship as a partnership,” and she believes that her success is intrinsically connected to the success of her clients. The key to her business, she says, is forming real and lasting relationships with those with whom she works. For Kimberly, the time management skills she employs to keep up with her growing family and volunteer commitments are also useful in assisting her clients whom, like her, multi-task every day.